Last week the City of Encinitas did something truly historic. For the first time in 24 years, we sent an approved housing plan to the State of California. If you’ll indulge me, I’d like to go deeper with you into this crucial issue that affects all of us here in Encinitas. For nearly all California cities, submitting an approved housing plan to the state is routine and unremarkable. Preparing a plan detailing where future housing can be built, specifically for lower-wage people, is required by state law every four or eight years, depending on a city’s history of complying with state housing laws. Most cities do this as part of the core function of their city government. However, in Encinitas it is literally an existential reckoning every time we attempt to accomplish this task. Since I became involved in city government back in 2013, developing a plan that would accommodate more housing has been the single biggest and longest-running source of strife in our city. In some ways this isn’t surprising, given our history. Our city’s very origins lie in our desire to limit and control growth. We incorporated as a city more than 30 years ago because we were unhappy with development decisions – adding strip malls and apartment complexes – that were being made by the county government. We wanted to control and limit our own growth. Some city founders wanted to severely limit certain types of zoning in particular, such as zoning that would accommodate apartment complexes. As a consequence, nearly all the apartment complexes you see in Encinitas pre-date our 1986 incorporation. Compared to every other city in the county, we have the lowest percentage of multi-family housing (i.e. apartments), as you can see in the graph below. At the core of these deep concerns is the belief that more homes equals lower quality of life and loss of our cherished Encinitas community character. It’s simply incorrect to assume that it all boils down to a hard choice between more homes and a charming Encinitas. What’s missed in this false equivalency is that adding some new homes to our largely suburban community actually enhances the diversity and vibrancy that is our community character. Simply put, we can add some new homes and still preserve and perpetuate our high quality of life. Also, it’s important to remember the economic reality of our prosperous city. 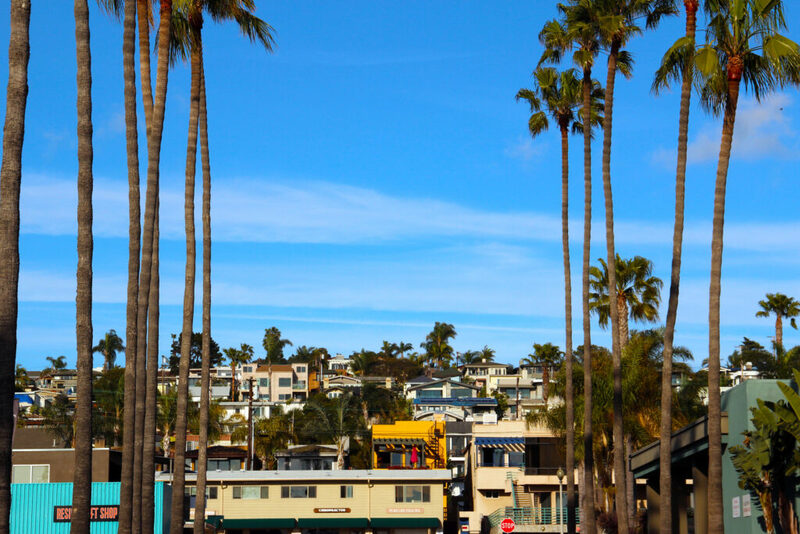 Encinitas will never become a “slum by the sea.” Our largest household income category is those making more than $200,000 a year – nearly 5,000 households. Between 2003 and 2016, we saw the addition of 1,484 homes in the “above moderate” category, only 21 homes in the “moderate” income category and a mere 61 units in the “very low and low” income category. As a reference, a “low income” single person earns $51,000 a year or less; a moderate income single person earns a maximum of $66,000 a year. 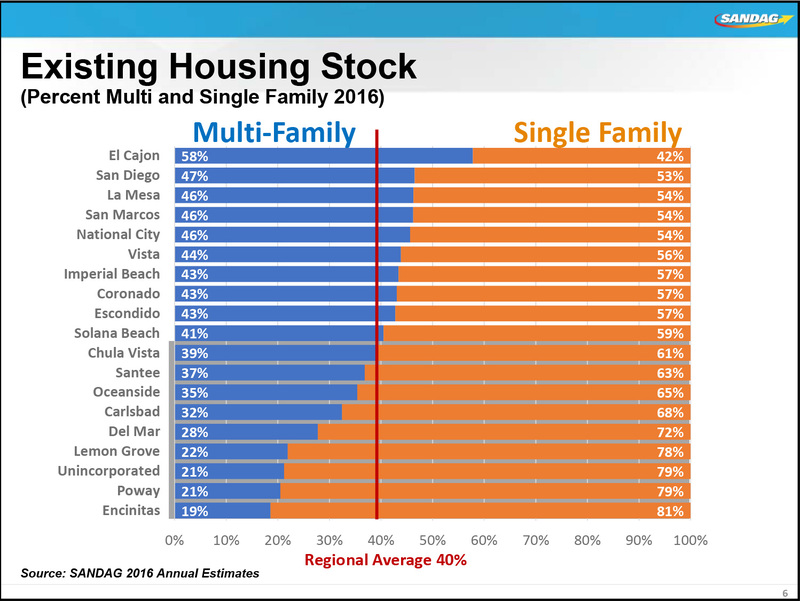 In Encinitas, we are building nowhere near the number of moderate income homes that we need, with less than 1% of our target reached in the latest housing cycle. Similarly, the amount of housing affordable to lower-wage people is also far below the state’s targets. It’s also important to recognize that Encinitas exists within the state of California, whose laws have taken aim at the state’s critical housing supply shortage. No city in the state can just decide that it wants to live outside the state system. Last year, California was ranked 49th out of 50 in housing units per capita, meaning that too many people are crowded into too few homes, and too many people live on the street. 50% of San Diegans cannot afford a market-rate rental and 60% can’t afford to buy a home. 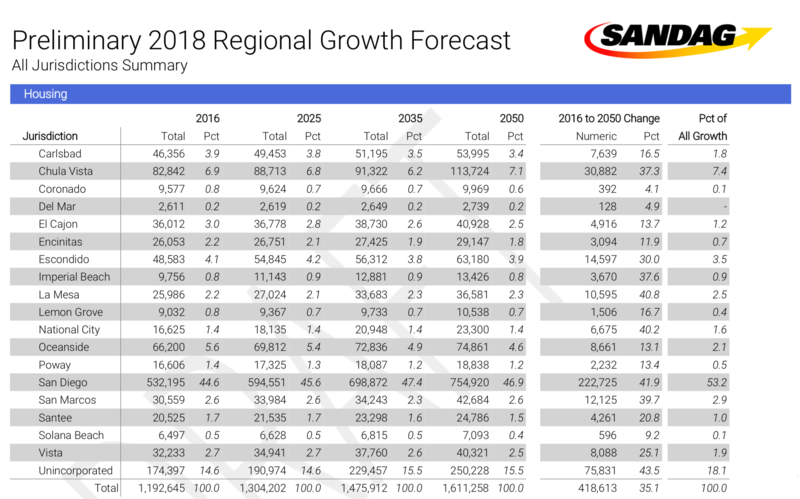 SANDAG’s preliminary housing growth forecast shows a modest 11.9% increase for Encinitas by the year 2050. You can compare that to the much higher estimates for other cities in the county using the chart above. Obviously, Encinitas alone cannot solve our statewide housing problem. Some people think that those who can’t afford the high housing prices in Encinitas should simply move elsewhere – essentially saying that we don’t owe those poor people anything. But the consequences of multiple communities sending that same message is hurting all of us. California’s housing crisis has resulted in increased poverty, steep yearly increases in home prices and rental rates, and employers facing increasing difficulty in securing and retaining a workforce. People are also experiencing increased health problems and diminished quality of life by being forced into long commutes that can exceed three hours a day because of the long distance between their jobs and homes they can afford. This isn’t propaganda pushed by the building industry, as some say, but a daily reality for many people. A simple maxim says that a model city has roughly the same number of workers as it does jobs. And according to SANDAG statistics, we meet that target. We have about 25,000 jobs in Encinitas and about 27,000 residents employed in civilian jobs. But wait – our local jobs are not held by our local residents. About 84% of the people who hold the Encinitas-based jobs drive here for that work. Encinitas residents only make up 16% of our employment base. Similarly, 87% of our employed residents drive outside the city for work. So we have serious commuting in and out of Encinitas every day – people trading places each day to keep their jobs. And what are these locally-based Encinitas jobs? The three largest sectors are healthcare, accommodation/food service and retail/trade. Many of these jobs pay lower wages. And the people who work in them have to drive into our city from other cities because of our limited housing for lower-wage people. So what’s the truth about Encinitas housing? It’s that we need to provide a modest increase in the amount of it – because a roof over everyone’s head serves the public good and enriches our local culture. And because every city needs to do its part to tackle society’s biggest challenges, including reducing monster commute times to help combat emissions that are creating climate change. It also means providing residents who live here now with places for themselves and their families to live as they go through the phases of their lives. There must be a mix of housing types to attract the diversity of families that is so essential to the vitality of our city. We can provide a certain number of smaller but still-desirable places for ourselves to live as we age – and for our adult children to live as young, emerging adults – while also preserving the Encinitas that we all love. I love Encinitas, and I believe that our community character comes from its variety and vitality. I’m devoted to preserving and enhancing the city that I know we all cherish. The pragmatic, responsible and forward-looking path is to help our ourselves, neighbors, parents and children by allowing a modest amount of new housing in Encinitas. And that’s why I supported our first state-approved housing plan in 24 years, and why I’m already working to create a sensible, community-enriching and protective housing plan for the next 24 years. Thank you for your interest in the future of our community and for reading this! If you’d like more information on the plan itself, this Coast News story has details. P.S. 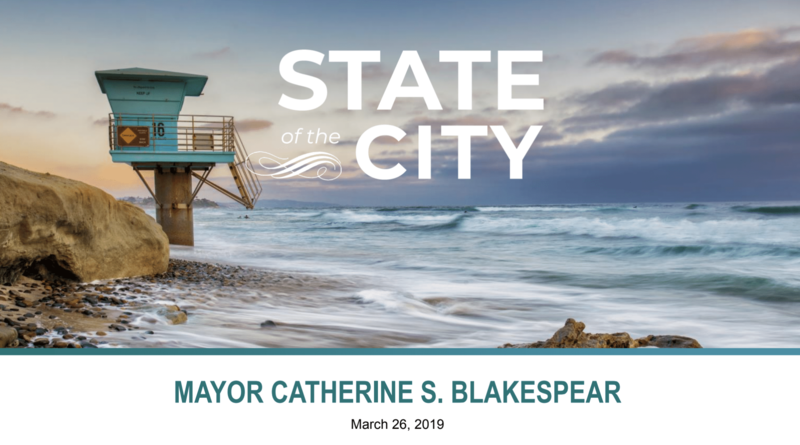 I’ll be delivering the annual State of the City address this Tuesday, March 26, sponsored by the Encinitas Chamber of Commerce. The live event is sold out, but there’s still room for volunteers (including students!) who will help the Solana Center for Environmental Innovation make the gathering waste-free. You can sign up to volunteer here. The video of the address will be available to watch afterward on the city’s website. I’ve been working on it for several weeks and I’ll let you know how it goes!